I noticed ants crawling all over and inside two of my hives today, so I surrounded the hives with cinnamon. I’ve read many times that cinnamon repels ants, though I’ve never seen it myself. 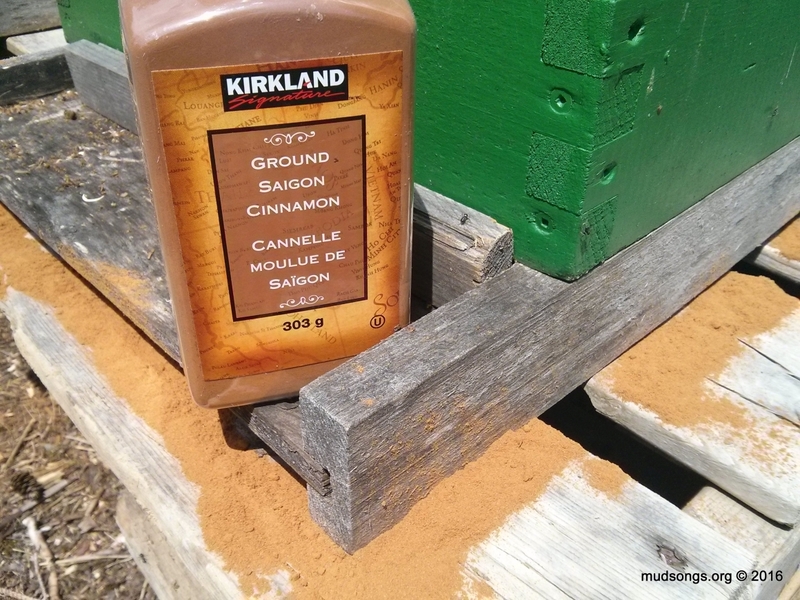 I sprinkled some cinnamon around one of my hives a year or two ago, but then it rained, so I don’t know if it works. Whether it works or not, I’m not too concerned about the ants. I think it would take a biblical amount of ants to do significant damage to a hive full of bees. We’ll see. This entry was posted in Ants, Diseases & Pests, Month of May. Bookmark the permalink. I have used cinnamon to ward off ants in the past. I had ants camping out on my inner cover. Every time I checked the hive, there would be a bunch of ants and lots of eggs. I sprinkled cinnamon around the rim of the inner cover. Seemed to help a little. HOWEVER…the honey harvested from that hive had a distinct cinnamon flavour! A beekeeper told me to try using grass on the inner cover. Works like a charm. You just need to refresh the grass every once in awhile as it goes brown from the heat of the hive.